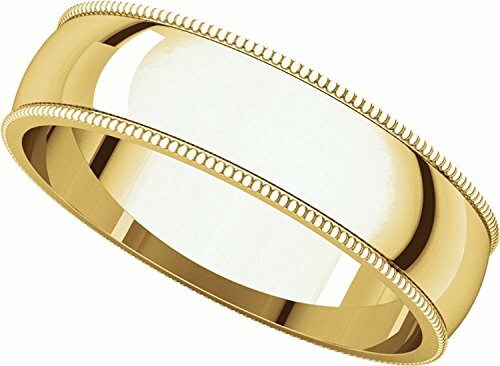 Plain Milgrain Wedding Band 14k Yellow Gold Ring Solid Polished Finish Regular Fit, 5 mm Size 8.5 by ZenJewels at SCRHI. Hurry! Limited time offer. Offer valid only while supplies last. Genuine real solid 14k gold wedding band ring. High quality wedding and engagment band for men and women. Special item for the eternity occasion. Genuine real solid 14k gold wedding band ring. High quality wedding and engagment band for men and women. Special item for the eternity occasion. Plain Milgrain Wedding Band 14k Yellow Gold Ring Solid Polished Finish Regular Fit, 5 mm Size 8.5. If you have any questions about this product by ZenJewels, contact us by completing and submitting the form below. If you are looking for a specif part number, please include it with your message.